It's time to sprinkle in a few images of Fall. 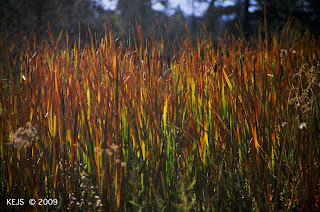 These Reeds from Mono Hot Springs (no NOT Mono Lake!). It's a Native word, not sure of the meaning, but common to the Sierra Region. High in the Sierra Nevada mountains, and accessible by a paved one-lane road, it was a favorite spot of Donald's, and where we did some high altitude training for our trip to Patagonia. Here are some of Don's Photos of Rocky Mountain National Park from this Fall. I first discovered the Church of the Holy Ghost during the 'Urban Disturbance' workshop that I participated in. 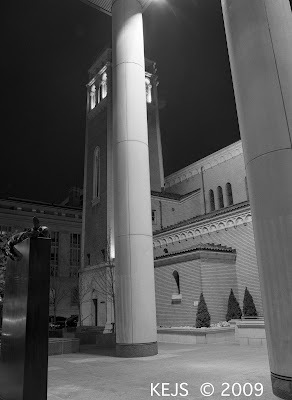 Remembering earlier posts, this is the Church surrounded by an office building, that security didn't want photographed. Fortunately for our Workshop they were no where in sight that evening. If you look closely at the photo above , in the lower right corner you can see a ghost image of one of the workshop participants. 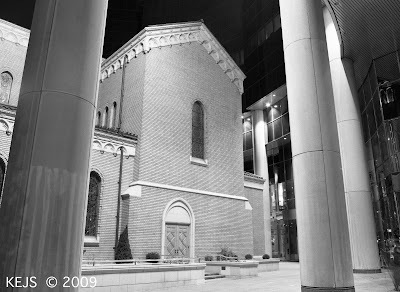 I first Met the 'Church of the Holy Ghost' during the Urban Disturbance Workshop. Apparently there were no security personnel around to shoo us away, because there were a dozen of us out there, certainly hard to miss. Sunday we'll see more of this location for 'Faith on Film'. Tripod eliminates the grain by allowing for long exposures. Note: the scanner adds some interesting texture to the bricks. I'm introducing a new theme that I've been working on here and there over the past three years. When I first moved to Colorado, I worked on weekends, so my Husband and I didn't get to spend much time together (that job didn't last long by the way), so we would take long evening drives around the Front Range. 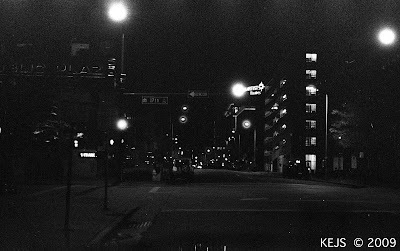 I had been introduced to Ilford's high speed film, ISO 3200, and decided to start my 'Denver Drive By' series. I'm still working on it, although we don't go into Denver as much anymore, and sometimes I take daytime photos. The tie that binds it all together is that the photos must be taken from a car (or in my case a Jeep) and preferably in motion. 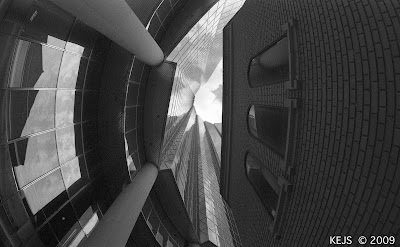 If you want to see some truly inspiring Urban Landscapes check out "Things I See", one of my Photo Influences. So you may have heard that the FBI recently arrested a local 1-person Al Qaeda Cell here in Denver. Actually he did go to Pakistan for training in bomb making and did have contacts in New York who were up to no good. And so we do have a little bit of a terrorist storm brewing. Unfortunately for this poor soul, he lied to the FBI, which is a violation of the Law. I learned through watching may true crime programs on TV (yes this is a shortcoming of mine) that the police never ask a question that they don't already have the answer to. Apparently he didn't know that. 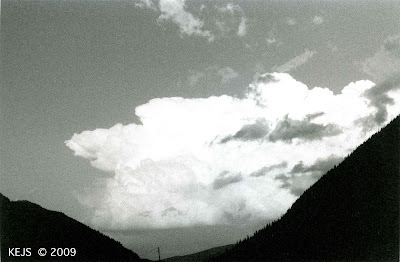 So I leave you with that thought and a photo of one of the last summer storms over the City of Denver, taken from near the Moffat Tunnel at close to sunset. I've survived my first week at work in a secured area.......Not quite a prison, but they do search your car, check ID's and have special dogs to sniff check deliveries. I doubt that I will be able to take pictures 'inside the fence' at work. 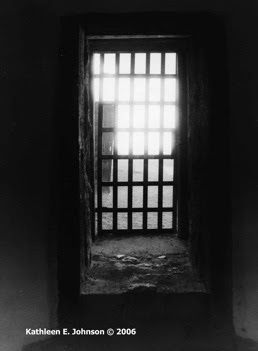 So I'll leave you with a scene from the Yuma Territorial Prison Museum, Arizona. 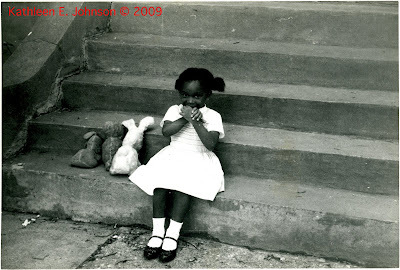 I had the opportunity to Live in Bristol England in 1990 while I was writing my dissertation. 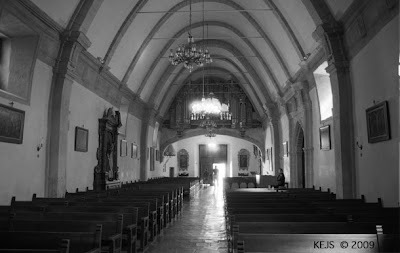 During this time I visited many famous and not so famous churches. I'll be sharing some of these with you. 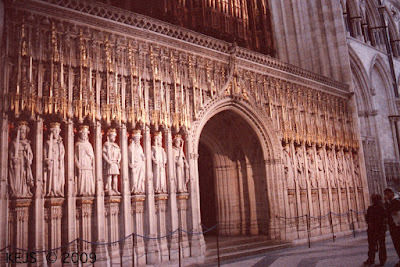 I visited York Minster because it was one of the churches that my Mother definitely wanted to see when she visited me in England. So we journeyed from Bristol to York. 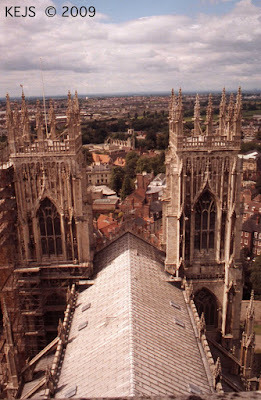 Here began 'Tower Climbing', as York Minster and a number of Cathedrals used to allow your to access the crossing towers (or domes in the Case of St Paul's in London). I have no idea whether this practice is still allowed given security concerns. 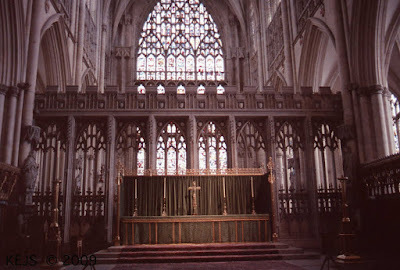 Fore Altar with Choir Screen and Original Main Altar behind the screen. Close up of Choir Screen. These traditionally separated the 'common' folk from the important people that were allowed to sit closer to the real Altar. It also adds a bit of mystery to the service, since you hear the voices without actually seeing what transpires. 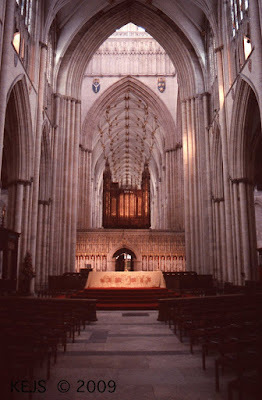 For Daily Services at most Cathedrals you sit inside the Choir, so the Tourists can still see the rest of the Church. I began synchronizing my visits with midday services so I could participate. These are after all (as with the Missions) functioning Churches that should be treated as such. 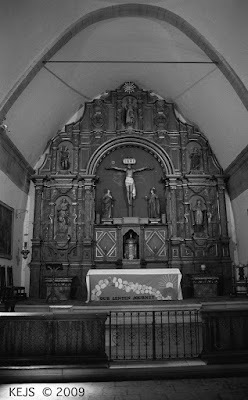 Main Altar that is behind the Choir Screen shown above. 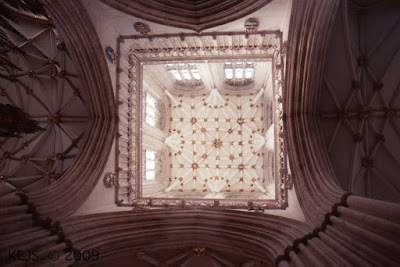 From the top of the Crossing Tower looking east over the Altar.Through the Middle Ages Churches were traditionally oriented East-West, so that the Faithful were facing the Altar and Jerusalem at the same time. A tradition that has been lost. Looking to the West from the Tower. In both photos you can see the Old City close by the Cathedral. You can easily imagine how inspiring these buildings were, as they were the skyscrapers of their day. 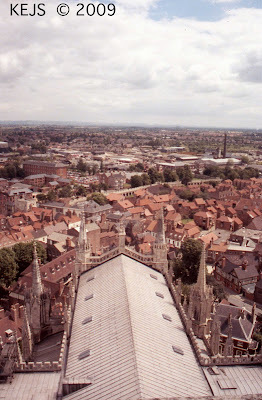 In many places such as York and Salisbury, these Churches still dominate their surroundings. I was first introduced to Cross Processing about three years ago. It is a technique popular with the Plastic Camera crowd, and for a complete explanation visit the Square Frog. His page is an excellent resource for all things film and plastic camera related. Cross Processing (XPro) in simplest terms means processing your film in chemicals not normally used for that film type. Usually advocates of the method process C-41 as E-6 or vice versa. But you can also process any type of color film in B&W chemicals as shown above. This may be especially fun and interesting if you have some expired color film lying around. I had not thought to step this far outside of the box until one of the blogs that I follow, Ruthless Photography, demonstrated the possibilities. On the advice of a friend I purchased some E-6 film that I truly hate after trying it! I've decided to salvage my investment by experimenting with various forms of cross processing; probably color to B&W. Our Newest Blogger Friend is 'Bristol Daily Photo'. I happened to have lived there in 1990. 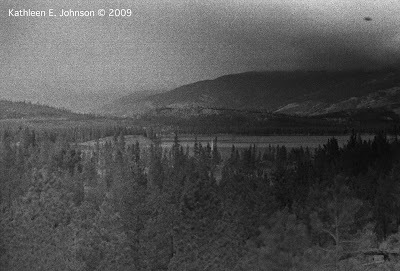 And that means that its time to post another Holga Gem! 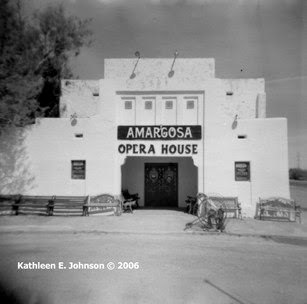 Welcome to the Amargosa Opera House, located in what Nevada calls a 'Living Ghost Town'. Amargosa, Nevada, is west of Death Valley National Park. As I resume my life in geologic research (more on that later), it seem appropriate to make my last entry on technical photography and wrap-up the Rock Photography Series. 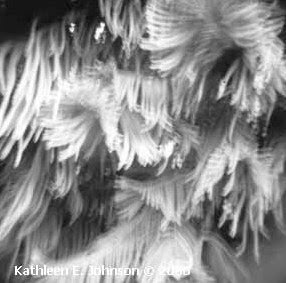 Most of you have heard of and seen Scanning Electron Microscope Images (SEM), but maybe you never really thought of them as photography. Anything involving a camera is photography. 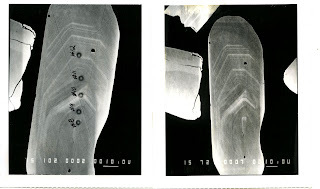 In this case the ‘light’ for the exposure is actually electrons reflected off of the surface of the thin section sample and collected by a spectrometer. Magnification may be 10X to 1000X depending upon, in this case, the size of the mineral crystals. An SEM is optimized for imaging, and has a less precise chemical analysis mode. When the same instrument is designed to optimize analytical capabilities it is called an Electron Probe Micro-Analyzer (EPMA). This is what I typically used, rather than an SEM. But it is still possible, and often highly desirable to take images of the samples. The standard film type was Polaroid 4X5. I guess the newer models will use digital imaging by now. 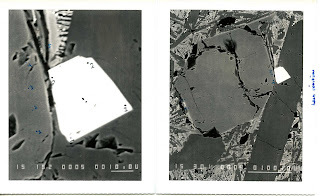 The white mineral is Spinel (Left a close-up with the scale bar representing 10 microns; Right the Spinel shown within the crystal matrix, scale bar 100 microns). Minerals composed of heavier elements reflect the most electrons and are therefore brighter. Spinel is an Iron-Magnesium oxide. The Points marked on the image to the left are the points that I chose to analyze. This is the mineral Zircon. Zircons have been used to date the oldest events in Earth History, because they are virtually indestructible once formed. Each layer that you see represents a new geological event in the 'life' of this Zircon. This mineral is a primary source for the element Zirconium and was mined fro a heavy mineral sand deposit. I want to take a break from the Missions for a while. Don't worry, I have many more to share with you. 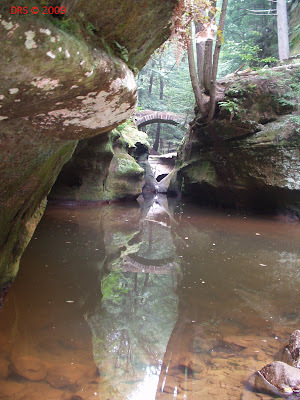 But before we take our break, Let us not forget that these Beautiful places were built by forced Native slave labor. 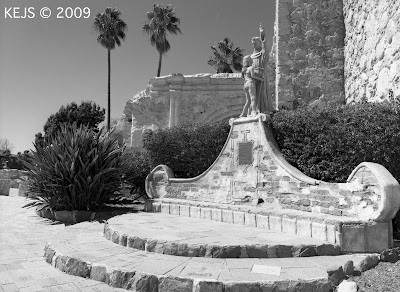 And despite what this statue at San Juan Capistrano would suggest, the Natives were perfectly happy with their lives before the Franciscans arrived. After all the Mission system turned free people into serfs, and killed many with European diseases. Can you imagine living in a world almost devoid of infectious diseases? I just want to pause to remember Them. I remember my first, last, and only visit to the World Trade Center in the Summer of 1987. I awoke that fateful September Morning in 2001 to news that I could not believe. New York City was my de facto second home. My mother grew up there as the child of Barbadan immigrants in an Italian-Jewish neighborhood in Brooklyn. 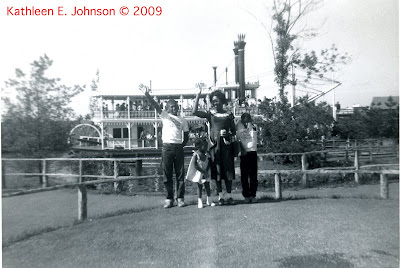 We visited family there every other summer, alternating NY with our traditional cross country road trip vacation so typical of the sixties and seventies. I was the only child at my inner city school in Cincinnati that ever went to NYC (my teachers verified this with my parents because the other kids thought I was lying!). 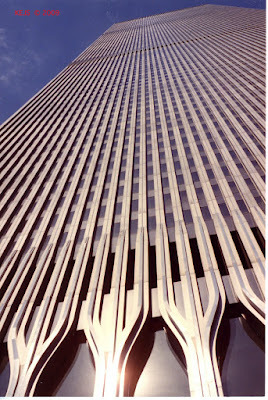 I never cared much for the modern architecture of WTC. But after my visit, I changed my mind about it. Welcome New Blogger Friends and Followers! Wow, where did you all come from? I think my followers have doubled in the past 10 days! 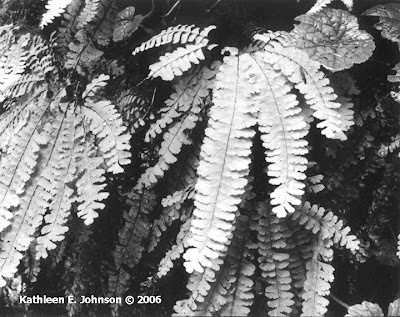 So a special posting of one of my website photos for my newest friends and followers: the Famous Ferns of Fern Canyon, California. And thank you all for your encouragement to continue to working in B&W. The Denver photo community is really negative about silver printing and film. That's why I started blogging in the first place. I will be doing some more Urban photography today, dodging security as needed. Turning Father’s Polaroid into a Medium Format Film Camera? It has been a while since I've talked about one of my cameras. I have inherited my Father’s Polaroid Land J33 camera. 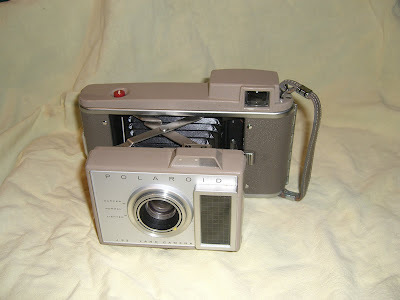 Much to my chagrin, it turned out to be a roll film camera (such Polaroid film was discontinued long ago). So my real hopes of making practical use of this camera were ended. The Land J33 was used regularly in our family to record seasonal events, such as BBQ, House Parties, and our Annual Easter Pictures. My Mom in 1959 with our tenant's cat Mister. I have found on the internet, instructions for “converting” this camera into a standard medium format film camera. But with no way to advance the film (Polaroid film was advanced by pulling on a paper strip attached to the film), the film must be advanced manually by opening the camera back. Of course this must be done in a darkroom, or a film-changing bag (both of which I have access to). But it will never be a ‘practical’ camera to use, and that is disappointing. The camera is in excellent condition. And I will run a roll of film through it and report back to you later. It will require Ilford ISO 3200 film, as the original Polaroid film was ISO 3000. 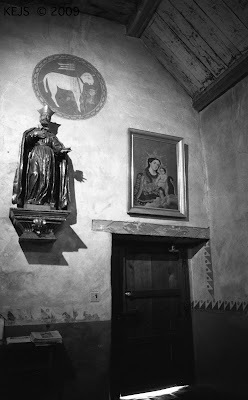 The Mission that was nearest to where I lived was San Carlos de Borromeo, better known as Carmel Mission. 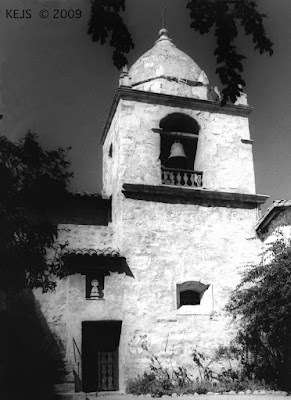 I had thought to complete a series on the California Missions while I lived there. 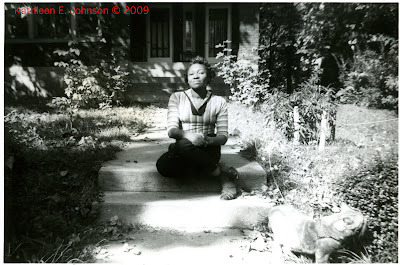 Then we moved to Colorado and the project ‘ended’, although I hope to do a bit more on occasional return visits. For history buffs, this is where Fra. 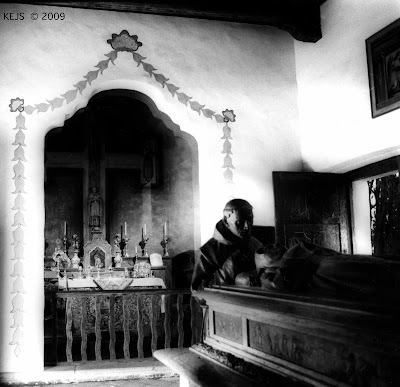 Junipero Serra, founder of the California Missions, is buried. His Funerary Chapel is shown above. 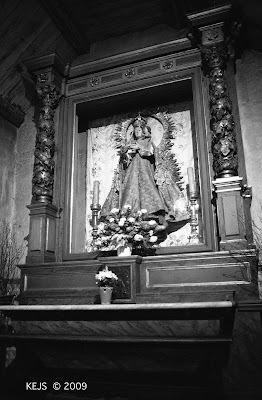 And a dressed Virgin, like the many I saw in Spain years ago. 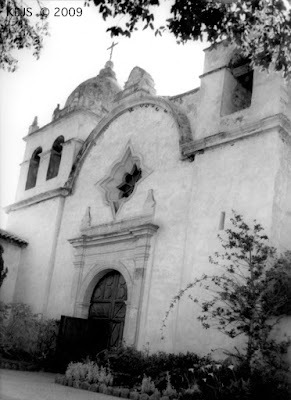 Mission Façade and courtyard printed on Warm Tone Paper; interior shots on cold tone paper. The Photo I wasn't 'Allowed' to Take! I had asked a few of you about your experiences (especially since 9/11) taking photographs of skyscrapers and other interesting buildings. Here in Denver I think they are overestimating their importance in the world. Not many people overseas think of Denver when they think of the USA. It's a nice place, but it is not Iconic to others. But my real point is, why build an interesting structure and then not want anyone to notice? So here are the Photos that security at the un-named building (because honestly I don't know the name) didn't want me to take. 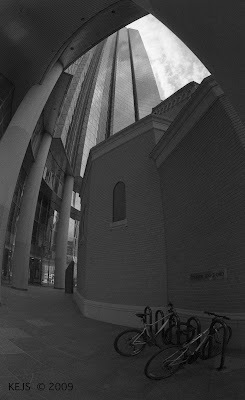 I had gone there because an image by the Canon Viewfinder reminded me of a church I had seen in Denver, that had a skyscraper built around it. We will revisit the 'Church of the Holy Ghost' in a later Faith on Film. And so another Icon of my early life passes on. 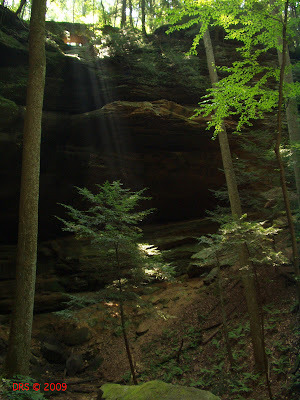 I have chosen a couple of quiet Ohio Scenes, again from the Hocking Hills, for the memory of Cincinnati Pops Conductor, Eric Kunzel. He founded the Orchestra in 1977, but I remember his beginnings with the Cincinnati Symphony, conducting their Pops concerts since 1965. So I grew up with him too. At his final concert appearance on August 1, 2009, 10,000 people turned out at a local Park to say farewell. I'll take some quiet time today to reflect on the richness of my exposure to the Arts and Music as a child, and listen to some Cincinnati Pops recordings. I was as usual, fooling around with one of my Holgas while visiting friends. This version, the 120N, has a BULB setting and a tripod mount. Anyway, I wanted to take a few photographs of some interesting vegetation in the yard. But the camera was on the BULB setting and I had made several exposures before realizing this. One ‘accident’ that I liked was this Norfolk Island Pine. Did you recognize it? My Point is that accidental exposures can be fun and interesting. If you are using film, then you probably have some interesting accidents lying around as unprinted negatives or discarded slides. Take and second look. And digital folks, maybe you shouldn’t delete every exposure that doesn’t seem quite right based upon that tiny screen on the back of your camera. Keep them all and take a second look on the computer, because there are interesting digital accidents too!